Since almost everyone has had to buy car insurance we all probably have heard and learned a number of myth-conceptions about car insurance. A good auto insurance agent will explain your coverage to you but many people think they can bypass the agent and do it all online or by taking 15 minutes to dial the latest and greatest 800 number ad on TV or Radio. The sad fact is for many who do, a 15 minute call, could (and has) end up costing a bundle. Don’t wait till after an accident to find out you don’t have the coverage you thought. Truth: Full coverage is a myth. If it existed, and covered anything and everything, you could not afford it. Full coverage is a term the banks came up with to mean you have the insurance required for financing the car, in other words, the loan is fully covered, not you. Truth: Color does not affect the rate of your insurance. What is taken into consideration is the make, model, body type, engine size, year and of course the driver’s information. So a red sports car costs the same to insure as a green sports car. A red station wagon costs the same to insure as green one. But the sports car does cost more to insure than the station wagon, and they usually come in red and most station wagons don’t. Truth: The repair cost of a vehicle and that model’s accident frequency actually are more of a factor than the car’s purchase price. A mid-priced car that more kids can afford to drive or that is difficult to repair will cost more to insure than luxury car that is typically driven by more mature drivers. Check with your insurance agent before buying a car to avoid sticker shock. Truth: If someone borrows your car and get in a wreck, it is your insurance (or you if you don’t have insurance) that will be responsible. If you borrow someone’s car and get in an accident, the owner’s insurance must pick up the tab. The car owner’s insurance is always primary, the driver’s insurance is secondary (if it is covered at all — discuss your policy exclusions with your agent). Truth: Car insurance is designed to pay you (or your bank) the fair market value of your car. If you owe more on the car than it is worth, you are responsible for the difference. Even if the loan is paid off, you still have no car and will probably have to find money for a downpayment and get a new loan to buy your replacement car. Be careful when buying a car that you don’t pay more for it than it is worth. PS. If it costs more to fix your car than it is worth, the company will ‘total’ it and usually offer you the chance to buy the ‘totaled’ car back for the same price they can get for it from the scrap yard. Truth: Even though there are many factors that influence credit, insurers have found that overall, a person who has poor credit is more likely to have an accident in the coming year than someone with good credit. In the past the only data the companies had was driving records, now they are finding that poor credit record can tell them more than a few speeding tickets. For the best rates, keep a close watch on your credit score. Truth: You don’t have to be ‘at fault’ to lose your No Claims discount. Call it the unlucky tax if you want, but it costs the insurance company money to handle your not-at-fault claim and you are more likely to have another one in the next year than the guy who has no claims at all. Truth: Going a few months without insurance may keep you from having to pay premiums but when you reinstate your policy, you will probably have to pay a higher rate due to the lapse. This higher rate, over the course of a year, could be more than your savings. Have your agent work up a quote for you as if you were starting over today and had not had insurance for a few months. Make an informed decision. PS. If you drop your insurance and are still driving, you could get a ticket which will cost you more than you saved or, even worse, get in an accident with no insurance. Don’t take the risk. Truth: If stolen out of your car, your ‘stuff’ is still only covered by your homeowners or renters insurance just as if it was stolen out of your home. If you don’t have homeowners or renters insurance, we can fix that! Truth: If you use your vehicle for business purposes or as a daily part of your job, your personal auto insurance may not protect you. While business auto insurance can cost more, you want to make sure there is coverage after an accident. 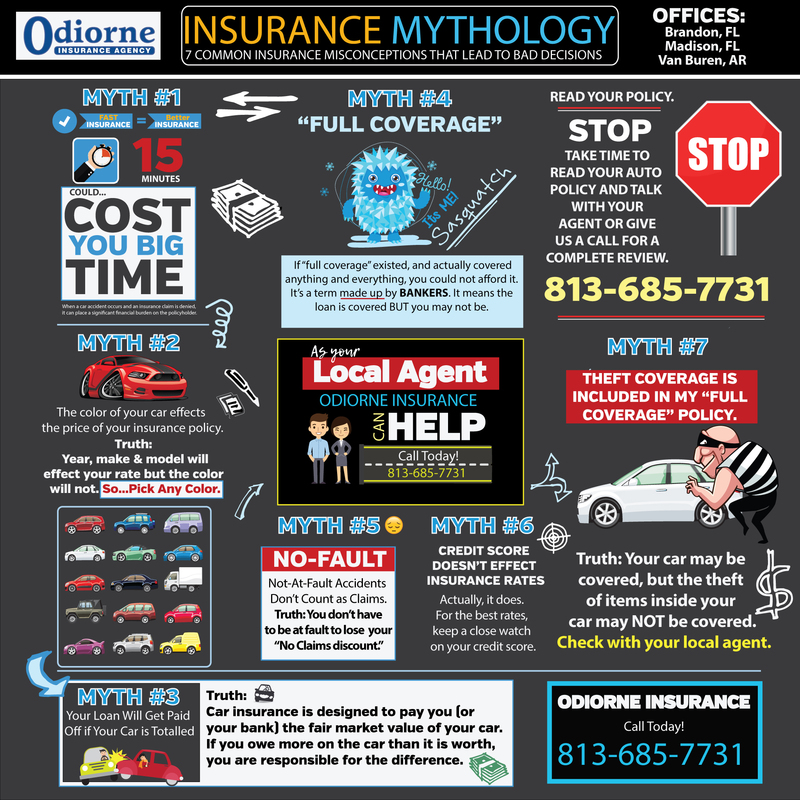 Myth: All insurance agencies and companies are the same and it really doesn't matter who you're insured through. Insurance is insurance. Truth: Depending on who you speak with, you may get legitimate insurance advise and recommendations tailored to fit your specific needs and sufficient to protect you from unnecessary risk and liability and you may not. Who you call, your agent, does and can make a huge difference. Let Odiorne Be Your Local “Insurance Agency”. Insurance is important and no matter what the ads say on TV, you don’t want to be doing it yourself or with someone in a huge call center. Work with an agent to find the coverage you need and all the discounts you qualify for. Never make assumptions about what your car insurance covers. As we said earlier, if it only takes 15 minutes, what you don’t know could end up costing you thousands of dollars.